If you have the goal of becoming the next superstar of India, then soon your dream can be a reality. You just have to grab the opportunity which Star Plus brings to you with the next edition of its famous talent hunt show India’s Next Superstar Season 2. The show is all about showcasing your acting and dancing skills. Now if you have a big dream rush and register fast for the auditions of India’s Next Superstar Season 2. Your age must be between 18 to 32, to take part in this competition. The right holder and the owner of this amazing talent show are Star India Private Limited. Star Plus and Endemol shine India both are looking for the participants with the best potential all across the country. So, do not hesitate if you think you can convince the judges with your skill. To become a next-generation superstar in Bollywood, you need to cross this hurdle to clear your path. The show was judged by two of India’s best directors Rohit Shetty and Karan Johar in its season 1. For participating in the show, with your acting and dancing, the fluency in Hindi is also must. You can register for the show through indiasnextsuperstars.hotstar.com The candidate will be provided a unique registration code on completion of registration. Then the candidate has to visit the center where the audition is held and fill a form over there. Don’t forget to take the unique registration code and a valid ID proof with you. You can check the full terms and conditions at www.startv.com/legal-terms-policies. What you need to prepare for the audition are a 2-minute dance number and a 1-minute monologue. The auditions will be held all across the country. The level 1 audition will be held in Delhi, Mumbai, Chandigarh, Bengaluru, Kolkata, and Pune. The level 2 auditions will be held at Mumbai Studio. 1st Part: All the contestants must perform a scene or act from any movie/play/program/book as monologue or speech for 1 minute. The language must be Hindi. 2nd Part: Next, he/she needs to perform a dance for 2 minutes on any music of his/her choice. Each and every participant must perform both act and dance to get qualified for the level 2 audition. 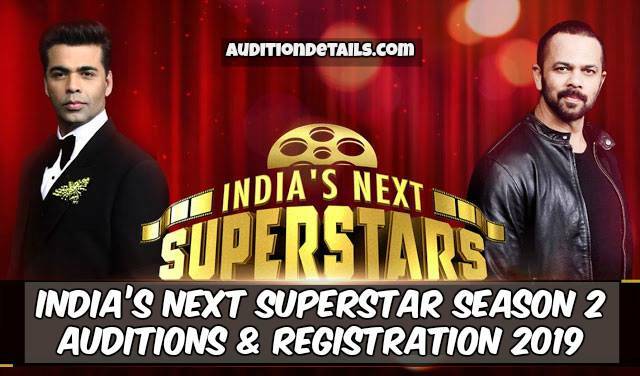 For further details on India’s Next Superstar Season 2 stay tuned with us and we will keep updating you. Level 2 audition me kya hoga?